passes in to smoother air and a more comfortable ride for all those on board. Passing out of a dramatic weather front this Britannia Airways Boeing 767 passes in to smoother air and a more comfortable ride for all those on board. 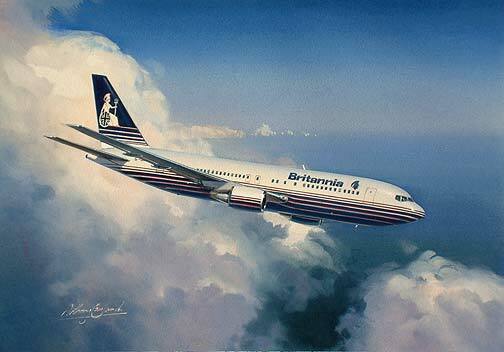 There are not many airlines that have survived as long as Britannia Airways has in the cutthroat industry of Charter Airlines. Rule Britannia is a limited edition print of just 250 each signed and numbered by the artist Anthony Cowland G.Av.A.